Preheat oven to 350. Cut the link sausage into four straight pieces approximately 5” long (the curved part will be left to snack on). Divide the pan sausage into four equal parts, and sandwich each of these inside a 12" long piece of parchment paper that has been sprayed with cooking spray, and folded in half. 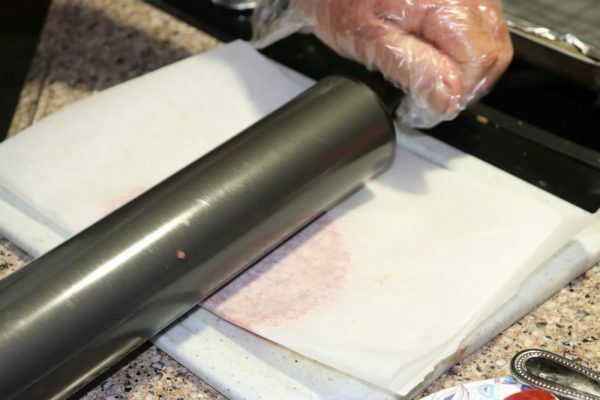 Using a rolling pin, roll each of the pan sausage portions to form rectangles about 5-1/2” x 6-1/2”. 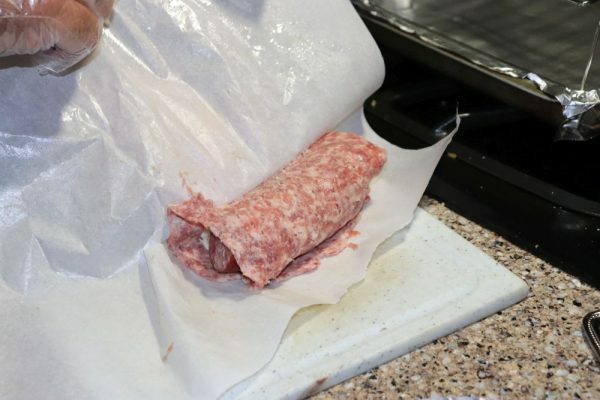 Then peel the top layer of the parchment paper back off the sausage. Center one piece of cheese on top of each of the pan sausage rectangles. 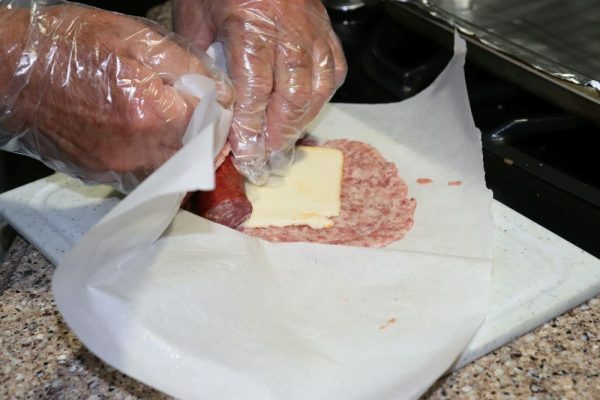 Place a sausage link on one edge of the cheese, and using the parchment paper to help, roll the cheese and pan sausage around the link. Push together the pan sausage that sticks out past the link to close up the two ends to form the sausage and cheese log. 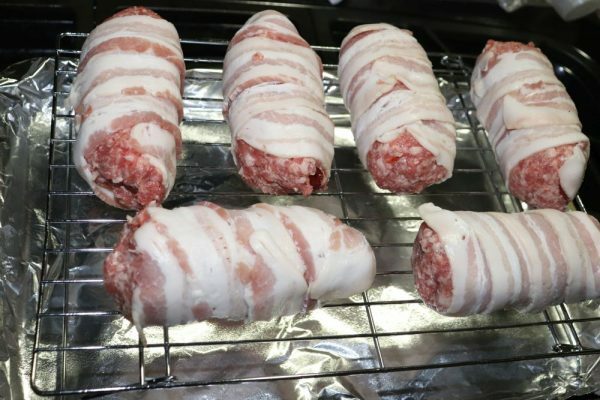 Holding the sealed edge up, wrap each log with two slices of bacon, ensuring that the pan sausage is covered by the bacon. Cover a cookie sheet with foil, and bake the sausage rolls on a rack placed on top of the foil, with the sealed edge of the pan sausage facing up to minimize the cheese oozing out. 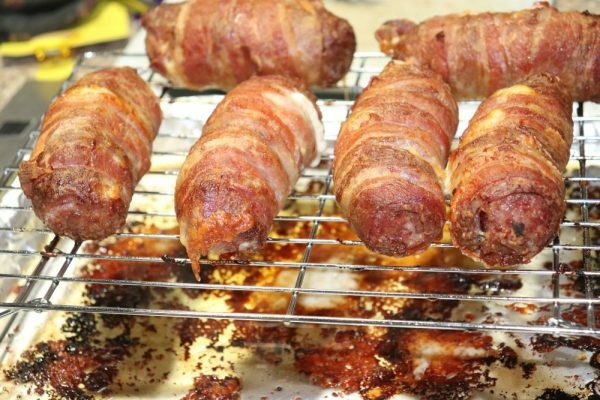 Bake at 350 degrees for 45 minutes; turn the sausage rolls so that the bottom side is up and bake for an additional 15 minutes at 400 degrees to finish crisping the bacon. Remove from oven and let rest for 10 minutes before slicing. Wash potatoes and cut into large chunks. Place in large pot and cover with water; boil until fork tender. Drain and mash, add butter, French onion dip, salt and pepper. Stir in bacon and cheese and garnish with chopped chives if desired. 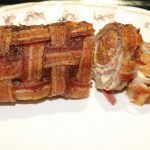 You can also use a longer link of sausage and about double the pan sausage, then cover with a bacon weave for a nice presentation on a larger serving. Pepper Jack Cheese can be used for a a different flavor. Enjoy with Peach Creek A Little Zinful Wine!